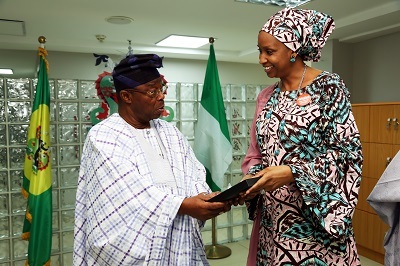 The Managing Director of the Nigerian Ports Authority (NPA), Hadiza Bala Usman (right) presents a plaque to the Chairman of Honeywell Group, Dr. Oba Otudeko who paid a courtesy call on the MD at the NPA Corporate Headquarters in Marina, Lagos. Photo by NPA MEDIA. 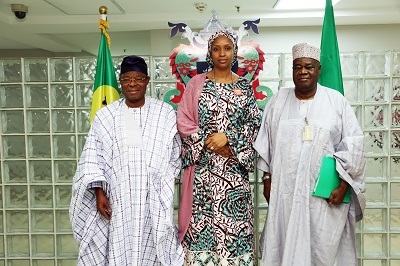 The Managing Director of the Nigerian Ports Authority (NPA), Hadiza Bala Usman (middle), the Chairman of Honeywell Group, Dr. Oba Otudeko and a Director at the Honeywell Group, General Garuba Duba (Rtd) when the Executives of Honeywell Group paid a courtesy visit on the MD at the NPA Corporate Headquarters in Marina, Lagos. Photo by NPA MEDIA.